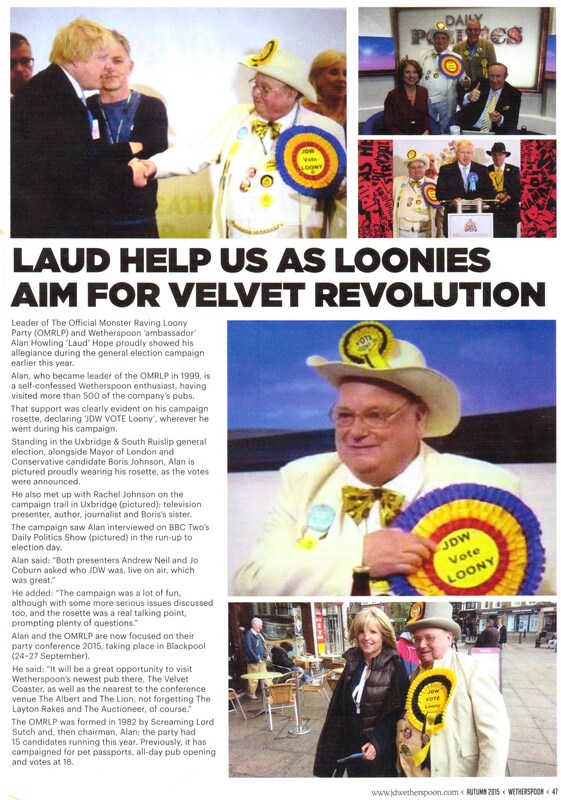 Howling’s local pub, the Prince Arthur in Fleet, was packed out on Wednesday night with Alan’s many friends and family celebrating his birthday and 16 consecutive years as Leader of the Official Monster Raving Loony Party. A special post General Election Co-ALE-ition ale was launched on the night called ” Monster Crush ” which is a 3.4% hoppy golden session ale brewed by the Wild Weather brewery from Silchester who you may remember brewed us the best selling Co-ALE-ition ale ” HowlinGale ” which has just successfully completed a three months national tour of Wetherspoon pubs across the whole of the UK. 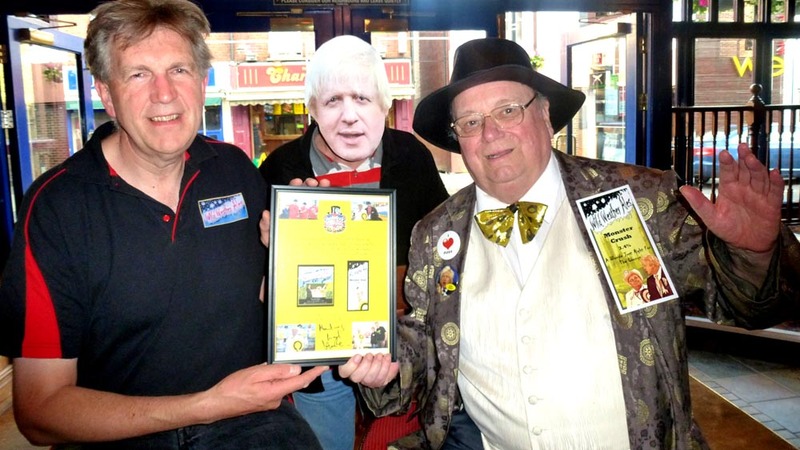 The Monster Crush pumpclip features a special photo of Howling looking admiringly at Boris Johnson taken at the Uxbridge & South Ruislip General Election last month as Boris was delivering his acceptance speech. Guests on the night included Colin Bex, Leader of the Wessex Regionalist Party, the Baron and Mad Max Bobetsky from the Loony Party, Mike Tempest and his team from Wild Weather brewery, CAMRA members from three different branches and several members of Hart District Council. A special award was presented to Mike Tempest (Owner/Head Brewer of Wild Weather) for selling 40,000 pints of HowlinGale to 400 pubs. Unfortunately not one of the invited local MPs, or Boris Johnson, turned up and the local MP pulled out the day before. Howling entertained and engaged everybody in his own inimitable charismatic style. He was aided and abetted by three Boris Johnson lookalikes who helped to make the night another memorable occasion for everybody who attended. On April Fool’s Day The Bigger Fibbers released The Official Monster Raving Loony Party General Election Song – A cover of the 50’s hit ‘Monster Mash‘ with lyrics changed to “They drank the mash.” The video features members of The Loony cabinet and bottles of Monster Mash from the Mash Brewery. In just under a weeks time we can all start to go Monster Mash downloading mad! – The Single is up on iTunes and Amazon and every other download site. Have a look at https://itun.es/gb/NB3x6 to be ready for Monday 3rd May when we can try for the charts. We need just 8,000 downloads to get it into the Top 40. A week has now passed since David Cameron and Wychwood brewery launched their Co-ale-ition ale without permission from Alan Hope and the OMRLP. It should have been called Cameron’s Real Ale Present as the acronym says it all. Marston brewery’s press statement on 25th March gave credit where credit was due for this IPA when they said “Co-Ale-ition Indispensable Political Ale was the brainchild of David Cameron”. Remarkably similar to our IPA – Co-ALE-ition ‘Hope & Glory’ ‘Insanity Prevents Austerity’, which was first launched in Dec 2013 and has sold over 15,000 pints since then. Cameron chose the word Indispensable coupled with Political Ale to describe his IPA ale, perhaps some more appropriate words beginning with the Letter ‘I’ which more accurately describe what has been done to the OMRLP by Cameron and Wychwood would be:- Indifferent, Indescribable, Indigestable, Indiscriminate, Indefensible, Indelicate, Indiscreet and Indemnifying. The only good thing about the Cameron Co-ale-ition beer label is that it does refer to the N0 10 which we assume recognises the OMRLP’s 10th Co-ALE-ition ale which was successfully launched by ‘Hogs Back’ brewery in March 2015. Would David Cameron have known about the OMRLPs Co-ALE-ition ales? Highly likely because Winning Co-ALE-ition, which features a photo of David Cameron with Alan Hope on the pumpclip was sold in The Strangers Bar (Houses of Parliament) for a week last June. Also Co-ALE-ition ‘HowlinGale’, which also features a photo of Cameron and Hope was on sale last May in Cameron’s favourite local constituency pub, The New Inn in Witney. It is hard to believe that either of these establishments would feature a pumpclip with David Cameron without clearing with him first. Howling wrote to Chris Keating aka Kris Cheating (Marketing Manager of Wychwood brewery) last week, Kris wrote back confirming that David Cameron’s Co-ale-ition ale would not be available publicly and would not be for sale now or in the future. Kris also offered Howling and his team a free brewery trip to help ease the pain. Howling has gone back to Wychwood brewery since seeking their permission to name our 11th Co-ALE-ition ale “The Real Hobgoblin”. Just as Co-ALE-ition is the OMRLPs brand name, Hobgoblin is Wychwood’s brand name and hope Kris will agree to the proposal as the publicity will benefit everybody. Apparently Wychwood’s Hobgoblin is David Cameron’s favourite ale, wait till Cameron gets a taste of the Co-ALE-ition branded “The Real Hobgoblin” . Emily Ashton, reporter friend of the Party, was given the exclusive and she wrote a wonderful story for Buzz Feed News which at the last count had been picked up by more than 50 other news websites. The Daily Mirror did a great follow up story and also ran a Poll amongst its readers as to which Co-ALE-ition ale they preferred – 95% voted for the Loony Party version. So what about Cameron’s Co-ale-ition ale itself, is it any good? The honest answer is we still do not know, there has been no feedback yet from anybody in the Govt who received a bottle. However we still have a group of CAMRA members on standby willing to sample Cameron’s ale and give their honest assessment but not even Howling can get a bottle of this Co-ale-ition ale from Wychwood brewery so we will have to speculate and let our imaginations run a little wild. Poor taste, very close to sell by date. Gassy, frothy and full of air (hot). From a coalition not in the best condition and lacking real strength. Beware of the sediment which like the deficit is left behind. Leaves a dry lingering bitter aftertaste and has an unpleasant aroma. Flat, hazy, cloudy and not clear just like their policies. Pale imitation of the real thing. No substance or real character. BOGCF – Buy One Get Clegg Free. Phillip Hammond decided to give his bottle to ISIS, sure fire way to get them on the run. Eric Pickles said it never touched the sides. Theresa May not even drink hers she is holding it back as a prize to give to anybody who achieves an Immigration target. IDS said its not a benefit he would cut. Osborne said its my duty to drink it but I did find it taxing. William Hague said it puts hairs on your head. Jeremy Hunt said he expected it put more pressure on the NHS and especially the A&E depts. John Bercow would no doubt say the No’s on the right have it. Michael Gove may have blamed the Whips. Maria Miller would be looking to put it on expenses. Vince Cable said he preferred the Coalition crisps and given the choice he would have voted against naming Cameron’s ale Co-ALE-ition. Danny Alexander was seeking more credit for this ale for Nick Clegg and the Lib Dems. Simon Hughes, the only member of the Coalition Govt that we definitely know who has tried both versions of Co-ALE-ition as he was at OMRLP’s Strangers Bar Co-ALE-ition launch event in June and would probably say there is no justice in this world. 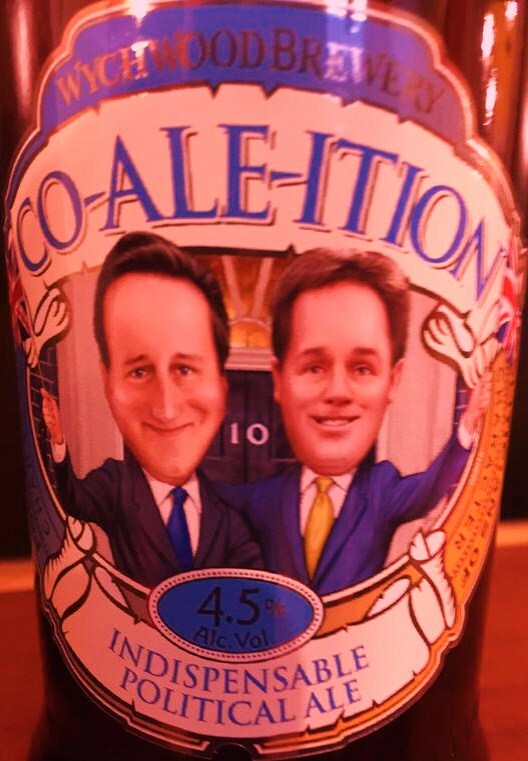 There has still been no apology received from David Cameron or Wychwood brewery but the faces of Cameron and Clegg on the latest version of Cameron’s Co-ale-ition beer label perhaps does confirm that they now have some regrets. 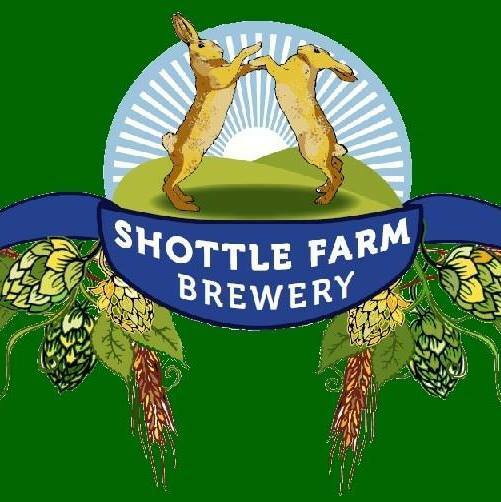 We are pleased and grateful to announce that Shottle Brewery of Shottle, Derbyshire have pledged to help support a local Derbyshire candidate at the General Election 2015. Shottle a small micro Brewery has made a name for itself by making quality beers for local pubs in Derbyshire, and provides great food , great beer and great service at the Bulls Head, Belper Lane End. 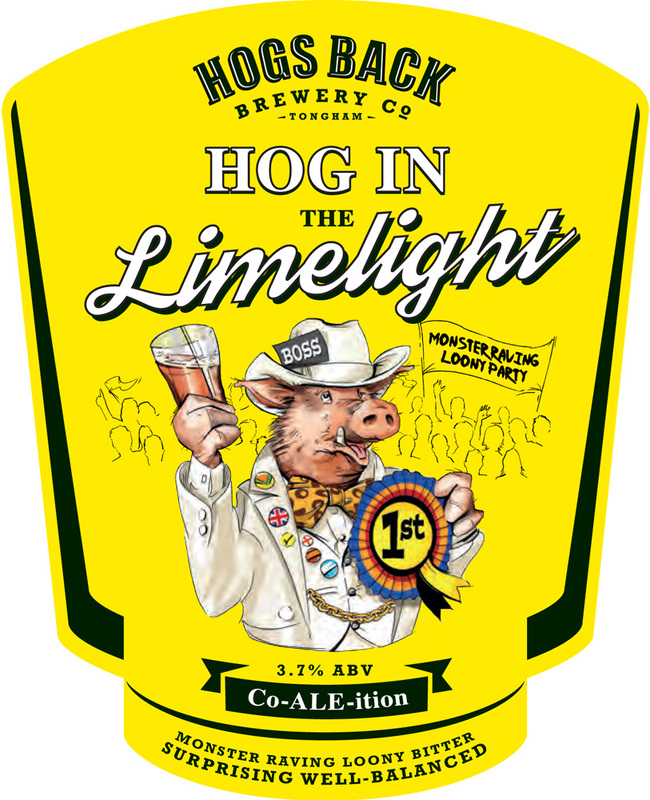 Hog In the Limelight is now our 10th different Co-ALE-ition ale and it has been specially made available to coincide with the build up to the 2015 General Election. Hog In The Limelight has already gone into Nigel Farage’s local village pub in Downe (Kent) this week. Hog In The Limelight is a rebranded version of Hogs Back’s HBB, which is a 3.7% light amber coloured, session bitter. This is the detailed itinerary for Thurday evening for the official launch of ” Hog in The Limelight ” (aka Hogging The Limelight), arranged by the Hogs Back brewery. Dave Paterson and Jill Adams from the Hogs Back brewery, together with Alan ” Howling Laud ” Hope (Leader of the Official Monster Raving Loony Party), will be hosting each official launch event in the four pubs. 1. 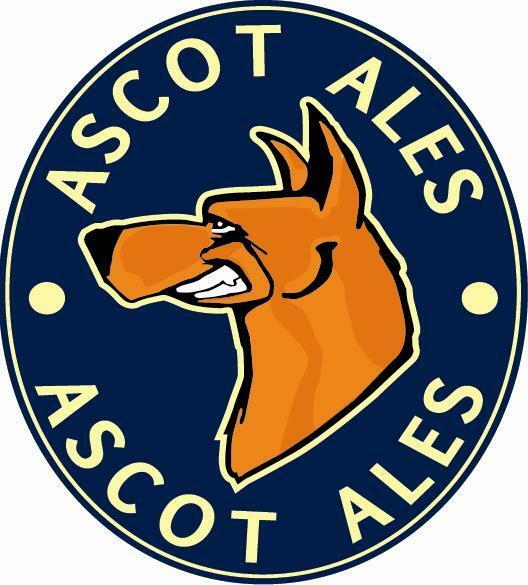 Nelson Arms (Farnham) – we arrive by 6.30pm. This will be the first official tasting of Hog In The Limelight. The Nelson Arms is in the CAMRA Good Beer Guides for 2014 & 2015. 2. Shepherd & Flock (Farnham) – we arrive by 7.15 pm for another official tasting of Hog In The Limelight.The Shepherd and Flock was in the CAMRA Good Beer Guide for 2014. 3. The Queen (Aldershot) – we arrive by 8pm for yet another official tasting of Hog In The Limelight and for the very first time in a Wetherspoon’s pub. The Queens is the newest Wetherspoon pub in the CAMRA SHB branch area and it opened in April 2014. 4. The White Hart (Tongham) – we arrive by 8.45pm at our final stop for the night.The White Hart is in the CAMRA Good Beer Guides for 2014 & 2015. There is no transport available. There will be local newspaper coverage of this event in both the News & Mail and the Farnham Herald. I will be taking photos and writing the stories for the local press. Hogs Back will also be using my photos on their website and on their Facebook and Twitter. The OFFICIAL Monster Raving loony Party is delighted to announce that it has formed a #CoAlEition with Wild Weather Ales brewery & JD Wetherspoons to release a special General Election beer for you to enjoy whilst laughing at the other political parties attempts to form their own Coalition. Howlin’Gale is going national across the whole of the UK during the months of April and May for the General Election and will therefore be available for ali 900+ Wetherpoon pubs to order from the 23rd March right through to the end of June. This should whet the whistle of the voters! Monster Mash went to the very top of Mount Kilimanjaro in Tanzania (Africa) on New Years Day. This is almost 20,000 feet above sea level. 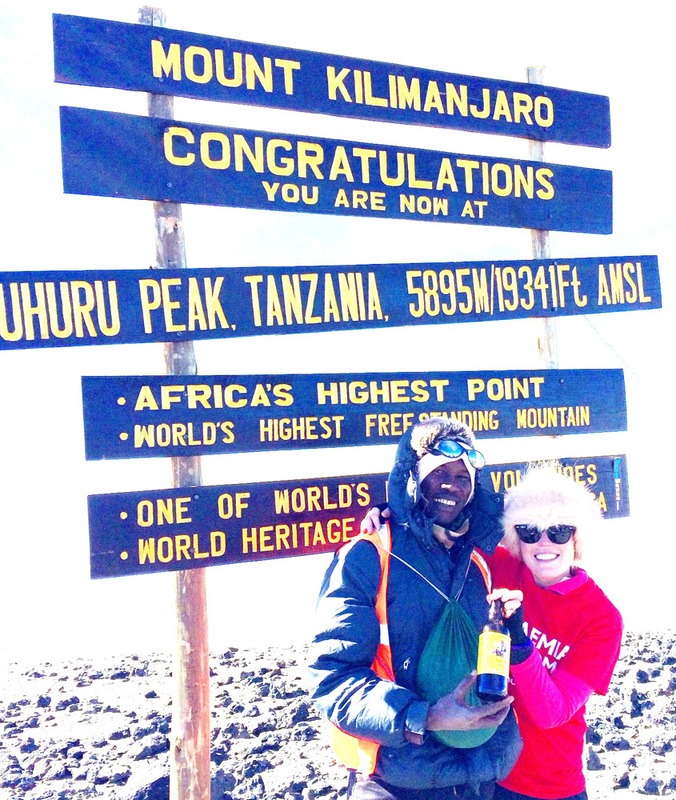 Melanie Carr successfully took Monster Mash to the summit of Kilimanjaro for Lymphona and Leukenmia research. Even Eric Morecambe is legless after drinking Monster Mash!! 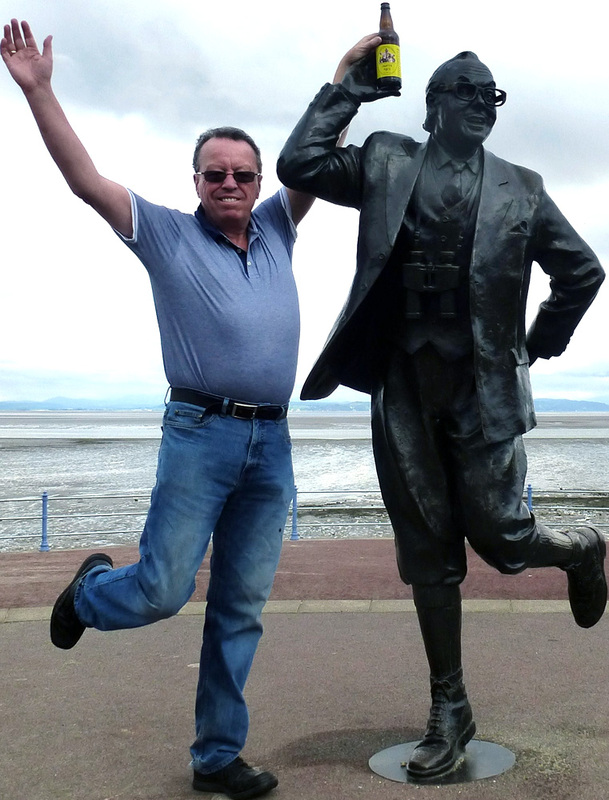 I see somebody has tried to take the Eric Morecambe statue from Morecambe seafront, they were caught in the act of sawing off one of his legs!! The Local Council have taken the statue down this weekend so that it can be repaired and are now going to put some security around it. I was in Morecambe only last month, see attached photo above of Eric, me with a bottle of Monster Mash.